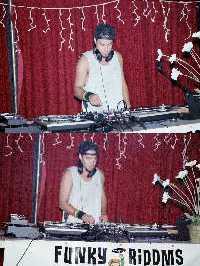 The night of Sunday, April 18, 2004 will be a milestone for DJ and promoter, Yaro Ayam-Ephram “DJ Smoky” DeSmidt. His Sunday club night, “King of Kings” at Berkeley’s Shattuck Down Low Lounge began two years ago as a grassroots effort, bringing together DJs and fans who loved reggae and dancehall music and culture. The Sunday night event has grown into an East Bay staple, consistently solid week after week, thanks to DJ Smoky’s hard work and determination. When I spoke to the busy DJ, he smiled broadly when I asked him what was planned for the two-year anniversary celebration. The April 18 event will showcase Jamaica’s talented dancehall deejay Determine, who is flying in specifically for the event. The night also appreciates the many selectors who have helped make the club night a success for the past two years. The DJ roster includes some of the best local reggae and dancehall DJs in the area: Rolo 1-3, King Corrin, Doogie, Mr. E., DJ De, Papa Joe, Jah Yzer, Ubald, Ivier, Irie Dole, and of course, resident DJ Smoky himself. “I want to give each selector a 20-minute set, because they have each, in their own way, helped make the club what it is today,” says the enthusiastic promoter, “I feel a real DJ fraternity strength–these DJs are family to me and King of Kings would be nothing without them,” confides Smoky. Smoky’s character does not go unnoticed in the community. He is known as being a very hard worker. DJ Jah Yzer remarks, “Smoky’s a fan of the music; that makes a big difference. Lustre Kings’ Corrin adds, “Smoky is not spacey and lazy with his works. I get along well with him because there is a group of us younger people who are very motivated to push the works out here in Cali (Lustre Kings with our label, Ivier with his store Wisdom Records, Smoky as a promoter, Jahworks.org, etc.). The artists that we work with are also on the rise; basically it’s just us coming together and organizing for the future of reggae in this part of the world,” he says. Smoky doesn’t intend to slow down any time soon, “The future will consist of the same reliable recipe so people can come dance the night away. 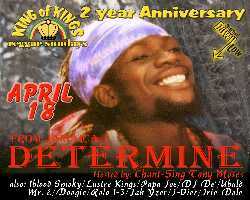 I want King of Kings to be on a level that we don’t even need to put a flyer or email out and people just show up because they know it’s gonna be nice.” Currently, he is working on bringing Cutty Ranks out in mid-May. The two-year anniversary will take place Sunday night, April 18 at the Shattuck Down Low Lounge, 2284 Shattuck Ave. in Berkeley, from 9pm until 2am. 21 & over with ID. $12 before 11pm and $15 after. For more info, call the Kings line at 888-491-0306. If any sound systems in the area need dub plates, Determine will be available in the Bay Area between April 19-April 22.